Shorebird abundance and spatial distribution of larval trematodes in the New Zealand mudsnail, Zeacumantus subcarinatus, were investigated in soft-sediment intertidal bays within Otago Harbour, South Island, New Zealand. 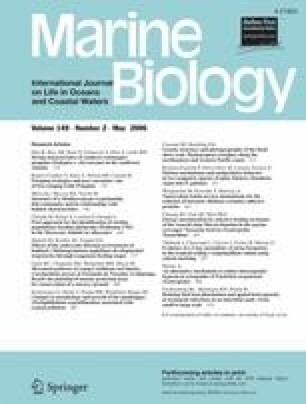 In a small-scale study, recruitment of trematodes to caged sentinel snails and the prevalence of infection in free-living snails were examined across a grid of fifteen 50×25 m plots arranged in a representative area of an intertidal bay, in relation to within-plot shorebird abundance (definitive hosts) and tidal height. In a large-scale study, natural spatial variation of larval trematodes in Z. subcarinatus was examined across 12 bays in relation to local abundance of shorebirds. Our results revealed that trematode prevalence in snails was positively correlated with bird abundance across bays (R2=0.503, P=0.006). In contrast, despite a difference in bird abundance between tidal heights, there was no evidence that trematode prevalence reflected the spatial distribution of birds in the small-scale study, suggesting that factors related to differences in submersion time may override the differential input of trematode eggs from birds. We would like to thank K. Holmes and K. Miller for technical assistance and M. Hardman for comments on an earlier draft. This study was supported by the University of Otago Research Committee, by means of the University of Otago Bridging Grant to B.L.F., by the Marsden Fund to R.P. and by The Danish Natural Science Council and the Carlsberg Foundation to K.N.M. The work in this study follows the guidelines of the University of Otago’s Animal Ethics Committee.